One of those “mom moments” hit me about a month ago. I got sick of the messes that consumed my kid’s rooms…again. Looking into their rooms and seeing a huge disaster is one of the biggest stressors for me. There have been so many different techniques I have tried to help improve matters and continuously they have failed. Finally I realized if I gave them less places to let clutter gather it would be easier to keep their rooms free from mess and open up their bedroom space a little as well. I started to create a space that consists of only their bed and dresser. My son’s room had a small 4 shelf unit that used to hold his clothes when he was younger. Now, he has a dresser and these shelves just proved to be one more place for his “finds.” One thing I want to do as a mom is encourage my kids to find what they love and explore this world. That means, we accumulate a lot of rocks, sticks, sand, and other randomness. While I don’t mind him collecting these treasures, I don’t love seeing them all over every piece of furniture in his room. Since clearing some furniture from their rooms, they have had no choice but to store their knick knacks and treasures in designated places and they have more room to jump around and play. In my post, Decluttering a Room One Week at a Time, I talk about all around creating a peaceful, clutter free home one room at a time. Part of the decluttering process includes deciding what to sell. Personally, I used to hate selling things online. Trying to arrange times to meet people and haggling over prices is not my favorite thing to do. One of the best tools I have discovered is Decluttr. They will buy your used phones, CDs, DVDs, textbooks, Legos and more! You can either go online and enter barcodes to your products or use their app for easy barcode scanning. See my full tutorial on how to earn cash with Decluttr! For other items, Facebook Marketplace has been my favorite go-to for selling old items like furniture. Personally, I love making a little extra cash from old things I no longer use so I can save for items more suited to our downsized way of living. A wildly popular new way to modernize your paperwork and minimize your clutter is by going fully digital with your papers! I purchased an eBook called The Paperless Home that completely teaches you how to effectively clear your paper clutter and still keep it all in one safe digital place that you can access from anywhere! 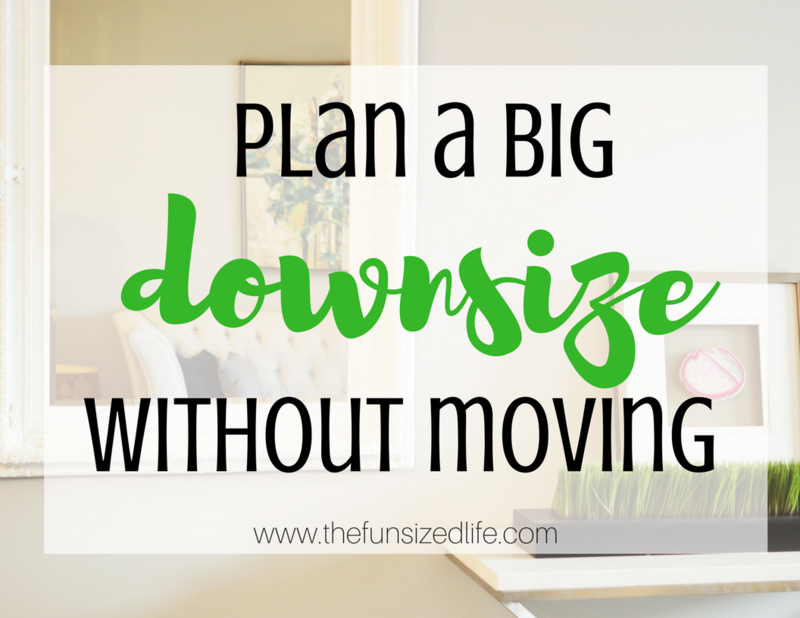 It definitely takes time and dedication to accomplish, but can wind up downsizing so much from your mind and home! Personally, I hate when papers pile up on the counters. I also despise digging through our filing cabinet and searching for a paper I haven’t seen in years. That’s why I decided to invest in this book and start making a change and downsize my home in a whole new way. I recently read the book, Present Over Perfect and in it, author Shauna Niequist talks about taking a vacation to the cabin. At the cabin, she had an epiphany. There were so many things she had at home that were not important and were completely unnecessary. Once she made her way back home she was more easily able to get rid of stuff that she used to deem important. Beyond appliances, plates and pans, she also realized just how many clothes she really didn’t need. Spending a lot of her life living out of a suitcase traveling for work made her realize she really only wore the same few outfits in a limited color scheme. While she had a closet filled with bright colors and adorable tops, she realized they all had one thing in common: they still had the price tags on them. When you are really feeling a strong desire to downsize and aren’t sure where to start, try starting with a capsule wardrobe where you put half of your wardrobe away for 3 months. You could also attempt the 3/33 Challenge where you only have a closet that consists of 33 items for 3 months. These challenges are great and can really make you aware of certain items that don’t hold as much value as you once thought they did. In one of my first minimalism inspired books I ever read, You Can Buy Happiness (and It’s Cheap), author Tammy Strobel and her husband started to realize they had more than they needed in their life. When the idea of downsizing first occurred to them, the first thing they did was start shutting doors in their apartment. If they were going to live the tiny house dream, they wanted to make sure it was something they could realistically do. They began shutting doors and living in a smaller space of their apartment. They knew what the potential square footage of their dream tiny house would be and they did their best to get used to it. If you are hoping to downsize (maybe not all the way to a tiny house) it’s good to consider the space you’ll be losing. When we made our downsize we knew we were losing about 2,000 finished square feet and about 1,200 feet total. This would seem scary but our family of 5 already seemed too small for the house we had moved into. All I could see was wasted space so it was very easy to imagine ourselves with less. If you have sold things that are of no use to you and started thinking smaller, it may be time to start ditching stuff left and right. Sell what you can, donate what you can’t and just ditch the rest. This was the hardest step for me. Not donating, but ditching. Throwing away things is painful for me because it feels wasteful. It feels like throwing money in the trash (which it is) and all I can imagine is me adding more of my useless junk into a landfill somewhere. In fact, it felt awful enough that I am now able to make better choices about what I purchase and how much we throw away each month. So many people are starting to hop on board with AirBNB hosting and are seeing major benefits. Some families use it to help pay off debt, travel more, or even use this as a good way to help transition to a new housing situation. If you have thought about smaller living, AirBNB might be able to give you some great insight. You could earn money while hosting your house and maybe the time away will help you realize just how much you don’t require all the space. Don’t worry, I’ve done all the research for you: How to Successfully Start Hosting (and Making Money) With AirBNB. Do you need to pay off debt first? Consider getting a loan in order to get a lower interest and monthly payment. Will you be gaining any equity by selling? What square footage are you comfortable with? What specifications do you have for a new home? Are you struggling with your credit? Get a free analysis! If you are planning a house downsize, make sure you do it smart. You definitely want to have your finances well set and paying off debt can be wildly helpful in doing this. If you need a little help knowing where to start try out my Fun Sized Budget Bundle. The bundle contains and easy to start budget as well as sheets to help you organize your savings and pay off debts! It’s important to have a good 20% downpayment set up, clear away as much as you can before the move and make sure whatever smaller house you purchase it has everything you need! The last thing you want after downsizing is to find yourself in something that’s too small or not quite what you wanted. Maybe after taking these steps, you find that you can feel more peaceful and at ease in your own home. There might not be any need to downsize. Clearing the clutter can do wonders all by itself. Whatever the reason, be sure to just enjoy the journey. Minimalism can be stressful if you let it which is the exact opposite of it’s purpose! Take the steps that you feel will benefit you and don’t ever feel like you have to rush through this downsizing gig. Your website design/layout is not set up properly. The pictures are massive and cover up half of the article, I couldn’t even read it! I’m sorry you had this experience. It appears clearly across phone, laptop and iPad for me. I’m not sure what there is I can do to fix the problem. My apologies.